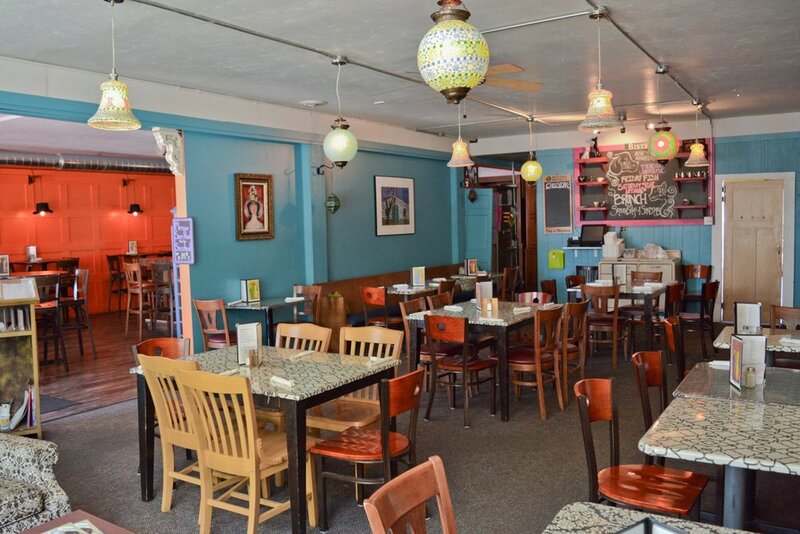 For 14 years, tucked into the Broadway District at the heart of Green Bay, our cozy cafe boasts not only phenomenal food, but an unforgettable, quirky atmosphere. Just like our colorful walls, our menu oozes flavor and originality. Whether you’re looking for a cool happy hour spot, a quick lunch, or dinner with friends… stop down and see us. We’re always happy to have you! Large, fresh mushrooms stuffed with seafood, cream cheese and Italian seasoning, then topped with mozzarella cheese & baked bubbly. White cheddar cheese curds with a side of Ranch dressing. A blend of spinach, artichoke hearts, cream cheese & parmesan, topped with shredded mozzarella cheese and baked to a warm, bubbly perfection. Choose from our house-made roasted tomato, olive tapenade or roasted garlic hummus. Served with pita points & cucumber. Creamy and delicious brown ale infused cheese sauce, sided by fries and focaccia bread for dipping. Served with marshmallow fluff on the side. $4.50 / cup - $6 / bowl - don't forget to ask about our soup of the day! Loaded with beef, beans, chilies, and garlic, served with a warm roll. Add sour cream, cheddar & onions for 1.50. A creamy blend of wild mushrooms, garlic & Brie cheese, sided by a warm roll. Topped with melted Provolone cheese & baked croutons. Hearts of Romaine topped with grilled lamb, kalamata olives, tomatoes, onions & feta cheese. Served with warm pita points & sided by Greek dressing. Fresh grilled chicken, red onion, cucumbers & feta. Sided by your choice of dressing. Substitute tuna for 2.00. Served on a bed of spinach with goat cheese, beets, and granola, with our house vinaigrette. 1/2 lb burger grilled the way you like it, and served with lettuce, tomato and onion. Add cheese for 0.50, or bacon for 1.00. 1/2 lb. burger topped with cream cheese, roasted garlic & sauteed onions. No substitutions. This is the one you've been hearing about! 1/2 lb. burger stuffed between two grilled cheese sandwiches. Add mushrooms for 0.50 or bacon for 1.00. 1/2 lb. burger topped with our famous pulled pork, beer cheese sauce, & onion rings. 1/2 lb. burger topped with bacon, cheddar cheese, and BBQ sauce, with house seasoning & onion rings. 1/2 lb. burger topped with sweet potato fries, pepper jack cheese, romaine & a special secret sauce mixed with onion, bacon, and pickles! Vegetarian, Vegan & Gluten Free options available. Substitute a portabella in any sandwich! Grilled chicken topped with roasted tomato, pesto & fresh mozzarella in a french roll. Two (2) soft, white tortillas filled with pan-fried fish, topped with baja sauce, crispy cabbage, & garnished with pickled red onions. Two (2) soft, white tortillas filled with your choice of Al Pastor, chicken or steak, topped with lettuce, tomato, onion, black olives & shredded cheese, served with a side of salsa and sour cream. 8 oz. steak, grilled your way, sided by fries. Add sauteed mushrooms & onions for 1.00, add four (4) sauteed shrimp for 5.00, add a side salad for 2.00. Ham, Genoa salami & provolone, baked & topped with olive tapenade & stacked on a French roll. House-made black bean burger with spinach, red onion, tomato, cheddar, & homemade BBQ on a French roll. Balsamic marinated portabella grilled to perfection. Topped with roasted tomato, spinach, fresh mozzarella & a balsamic glaze. Bacon, provolone, spinach & tomato on grilled dark rye, with a side of hot bacon dressing. Fresh grilled lamb, tomato, onion & tzatziki stuffed in a warm pita. Add kalamata olives & feta for 1.50. Shaved ribeye, sauteed onions, mushrooms, & your choice of cheese on a French roll. Grilled Ahi tuna, drizzled with a creamy pesto sauce. Sided by garlic mashed potatoes & a side salad. A huge portion of hand beer-battered, deep fried walleye, served with cafe potatoes, coleslaw & rye. Our beer-battered walleye, served on a French roll with lettuce & sided by our homemade potato chips. Three (3) hand breaded, deep fried perch filets, served with cafe potatoes, coleslaw & rye bread. A blend of strawberries, cream cheese & mascarpone, stuffed between thick slices of egg bread. Rolled in cinnamon butter with frosted corn flakes, grilled to perfection. Two (2) homemade biscuits, topped with our sausage gravy and sided by two eggs the way you like 'em & cafe potatoes. Served with cafe potatoes & toast. Two (2) poached eggs with ham, served on an English muffin & smothered in hollandaise. Sided with cafe potatoes. Our half pound Angus burger topped with an egg your way, raw onion & American cheese with a side of cafe potatoes. An English muffin with grilled pineapple, sweet & spicy Mexican pork, poached eggs & smothered in cilantro lime hollandaise. Two (2) eggs any way you like them, with your choice of bacon, ham or sausage patty & toast with a side of cafe potatoes. For the strong, willing & daring! A sandwich with two eggs, sausage patty, cafe potatoes, raw onions, and American cheese stuffed between thick egg bread & smothered in sausage gravy. English muffin, sauteed spinach & tomato with our spicy hollandaise sauce. Sided with cafe potatoes. Vodka, Clamato juice, shrimp, celery & a breadstick. Vodka, tomato juice, string cheese, beef stick & sport peppers. Vodka, tomato juice, brussel sprouts, pickled mushrooms & a boiled egg. Espresso vodka, coffee & cream over ice. Peach Schnapps & orange juice. Ask your server about today's offering! Served with cafe potatoes & fresh fruit. Information will not be sold or shared with third parties. Follow us on social media for the latest news, events, and specials!